It was amidst fire and smoke that Yahweh, God of Israel, revealed himself to his people. He told them: over six days you shall labour and do your work, but on the seventh you shall not labour, for in six days Yahweh made heaven and earth, the sea and everything in them, and rested the seventh day. Thus the week goes back to the time just after the Exodus, 1447 BC, when God revealed himself to Israel in ten commandments. It was a new idea. So far as is known, no other ancient people regulated their lives according to this cycle. The creation is described in Genesis, the first book of the Bible. Written in the 2nd millennium, Genesis distils a tradition traceable back to the mid 3rd millennium – a time when writing had developed sufficiently to be able to capture complete narratives. In oral form the tradition may have gone back further still, even to the events themselves. Nothing in the universe exists now as it did in the beginning. The problem of reconciling the account to what we know about the world’s evolution since the beginning is not solved by arguing that the six days denote some longer period. If the world no longer exists in its original form, its creation over six days cannot be in conflict with what we see now, and reconciliation schemes such as the ‘gap’ and ‘day-age’ theories solve nothing. The account opens with the statement that in the beginning God created the heaven and the earth. In English, ‘heaven’ and ‘the heavens’ have rather different meanings. In Hebrew the word is the same – shamayim (a dual) – and while it sometimes means the region immediately above the earth, i.e. the space which contains the sun, moon and planets, in other contexts it has the sense of everywhere above, without limit. In the absence of any limiting context, ‘heaven and earth’ denotes the whole universe. No pre-existing raw material is mentioned, because none existed. ‘Created’, Hebrew bara, implies that God brought the raw material itself into existence. As in English, bara has more pregnancy than the word ‘do, make’, asah. While creating includes the idea of making, making does not necessarily include the idea of creating. Creation implies doing something that nature itself cannot do, and obviously nature cannot bring itself into existence. The new heavens are in darkness. There are no stars, and Earth is enveloped in formless water. The spirit of God hovers over the water, invisible, the verb metaphorically suggesting the fluttering of a bird. Hebrew ‘spirit’ (ruah) also means ‘breath’ (as in Gen 6:17) or ‘breeze’ (3:8). The spirit of God moving over the waters at the Creation parallels the natural wind (8:1) that passes over the waters at the moment of regeneration, after the world’s destruction. Without light, time cannot be measured in days, months and years. The days are defined by the phenomena of nightfall and daybreak (not, as in most translations, simply evening and morning), and nightfall comes first. The most natural point from which to reckon the start of a day is dawn. However, the Israelites, perhaps uniquely, reckoned days as beginning from sunset (Ex 27:21), presumably because they knew that the days of the original week began at this time. They knew it because God had told them. Left to their own imaginations, they would have written ‘there was daybreak and there was nightfall’. In relation to the sun they distinguished two such moments: the point when the sun set and the point when there was complete darkness, as in the instruction to sacrifice the Passover lamb ‘between the two evenings’ (Ex 12:6). In nearly all mythical attempts to understand the beginning of the world, the sun is the oldest object in the universe. The fact that the light of the first day is not attributed to the sun is, like the reversed order of night and day, an indication that the account was not a product of human imagination. Wherever the light came from, there now existed a single source of light, and the Earth was spinning about its own axis in relation to that source. The period is expressly defined to encompass one night and one day. The pattern of the succeeding days shows that the text describing the first such period does not begin with ‘In the beginning’, but with the phrase, ‘And God said’. The preceding two verses describe a situation that exists in time prior to the first day, before time can be measured. It is often urged that religion informs us about the ‘why’ of creation and science the ‘how’. But Genesis tells us nothing about why God created the world (disregarding some functional explanations in vv. 14 and 29–30), whereas the how is clearly stated. Things take shape or come into existence not through some intrinsic capacity to become ever more organised, of themselves, but in response to a supernatural voice. As Psalm 33 puts it: ‘By the word of Yahweh were the heavens made, and all their multitude by the breath of his mouth. He spoke, and it came to be; he commanded, and it stood fast.’ Creation distinct from evolution. Evolution, the unfolding realisation of an innate potential to diversify and adapt in response to a changing world, necessarily follows creation. ‘Let there be light’ is the first of ten creation commands. Although the source of the light is not identified, it must have been something physical, for God subsequently separated the light from the darkness, calling the light ‘day’ and the darkness ‘night’. It cannot have been the sun, created on Day 4. And it cannot have been other stars, for we know from astronomical observation that stars form naturally. Condensing from clouds of gas and dust, they are forming still. By definition, creation is a purposeful act distinct from anything that can occur of its own accord, that does not require supernatural power. Astronomers investigate the early universe by looking for objects furthest away, since light travels at a finite speed and those objects appear as they were when the light left them, not as they are now. Amongst the most distant objects are quasars, bodies like stars but much more massive and more luminous – billions of times more luminous. They are thought to be powered (paradoxically) by black holes and situated at the centre of primeval galaxies, but at these stupendous distances the reality is impossible to determine. More probably they are, or were, the ultra-energetic nuclei of what would only later become galaxies with central black holes. What we do know is that as we travel back in time, quasars become both more luminous and more numerous, suggesting that the present universe is darker than it once was. Whether the black hole at the centre of a galaxy is luminous or dark depends on its mass: that at the centre of the Milky Way is dark because its mass is relatively small. Apart from stars and black holes, quasars are the only sources of light in the universe, so we can infer that a quasar illuminated the Earth on the first day: the primeval ancestor of the invisible black hole at the centre of the present Milky Way. The quasar shone with so much energy that one side of the Earth was lit up, just as if the Sun was shining. Similar quasars blazed with light throughout the universe. primordial concentrations of rotating hydrogen ejected jets that became the arms of galaxies as they centrifugally wound around the nucleus. A naturalistic cosmology is obliged to go for the first option, invoking ‘dark matter’ (‘dark’ because it has never been detected) to provide additional gravitational attraction. Observational evidence favours the second. As one goes back in time, galaxies become more compact, not less, and more massive. Over time they ‘downsize’. While image resolution is poor at this distance, the earliest galaxies seem to be dominated by ultra-luminous quasars, even superquasars, with masses equal to billions of suns, at a time when, according to theory, matter was flying apart and should not have been condensing into massive clumps. No matter how far back in time we look (which is now within 3% of time zero, according to modern cosmology), intergalactic space is essentially empty. It is therefore reasonable to deduce that quasars spawned the billions of stars making up the present galaxies. As astronomy confirms, the earliest quasars commonly blasted out star-forming matter (Bischetti et al. 2018). 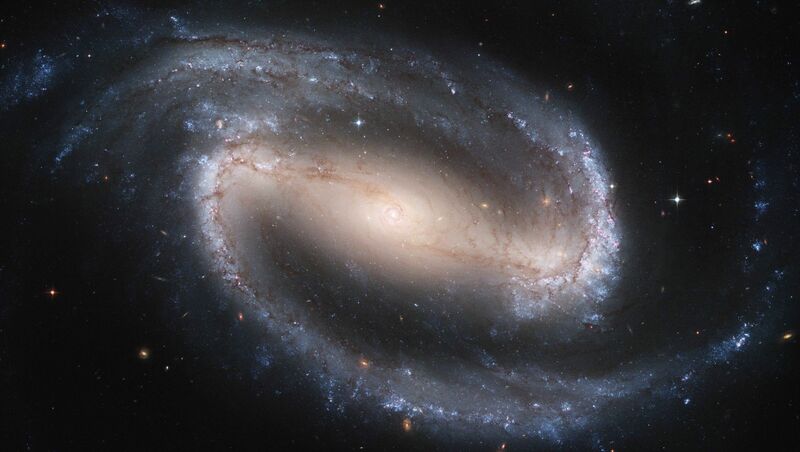 Most spiral galaxies, at least in the nearer universe, show two major arms, as does our own galaxy. The stars of the Milky Way formed as the gas of these ejections condensed. Whether the age of the universe is to be measured in billions of years depends on whether the speed of light has been constant through time. If it has been slowing down, as evidence of rapid geological processes indirectly suggests, light from the most distant stars would not have taken billions of years to reach us. Because of the intimate connection between the velocity of light and nuclear energy, stars would have gone through their life cycle much more quickly than their current rate of fuel-burning. As the quasars ignited, the heavens ceased to be dark and formless. With the Earth lying close to the edge of the present Milky Way, most of the light reaching it came from one direction, its present centre. The Earth revolved before the light, and there was nightfall and morning, one day. The period is expressly defined as one revolution of the earth. Proverbs (8:27) says that he drew a circle on the face of the deep, referring to the continually moving terminator between night and day on the earth’s sphere. Most ancient peoples thought of the sun as revolving around the earth, inferring such motion from the rising of the sun in the east and its setting in the west. They thought of the earth as a plate rather than a sphere. The Israelites’ conception was different. In their view the first light, and the daily rhythm of light and darkness, came not from the luminary that rose in the east and set in the west but from an unknown source beyond the solar system, in relation to which the earth rotated. The purpose of the outer waters was to shield the Earth from the radiation emitted by the Milky Way and other galaxies at a time when cosmic radiation was much more intense and the Earth, not yet having differentiated into mantle and iron core, had no magnetic field. Water would have provided an effective shield against cosmic radiation. Originally above the firmament, that water has since dispersed and frozen as the heavens cooled. To the great surprise of astronomers, water has been found throughout the solar system, from Mercury to the Kuiper Belt, the region of sparse ice and rock beyond Neptune. On Mars the canyons, flood plains and ocean basins left by this water can still be seen. Around the Earth, its inward diffusion was arrested by the atmosphere, until an asteroid storm at the time of the Cataclysm ripped through the atmosphere and caused the water to collapse. Torrential rain drenched the earth for 40 days. The waters of the deep are gathered together into one place, and land appears. These gathered waters are called ‘seas’ and the land ‘earth’. Since ‘sea’ can refer to any large expanse of water, including for example the Sea of Galilee (Jos 12:3), ‘seas’ here may denote lakes rather than open ocean. As with ‘heaven’, ‘earth’ now has a limited meaning: the dry terrain that will constitute the environment for the animals created on Day 6. Other texts help us visualise the arrangement. Genesis 7 refers to springs supplied by water from the great deep, and in Psalm 24 we read that the earth was ‘founded upon the seas’, ‘established upon the rivers’. The deep supplied the rivers that flowed out of Eden. The one place into which its waters were gathered must have been the subterranean space created as the land was lifted up. Apart from lakes and rivers, land covered the whole planet, resting on foundations that were sunk into a now subterranean ocean. Lakes, rivers and seas were all interconnected. In response to another command the earth puts forth vegetation: seed-bearing plants and fruit-trees with seed in their fruit, each according to its kind. The earliest organisms to be created are terrestrial, not marine. In the fossil record, plants and trees do not appear until after marine algae and animals. Fungi, mosses and ferns reproduce by means of spores. Seeds differ from spores in having a food store to assist germination, but otherwise there is no sharp distinction; indeed the word ‘spore’ in English derives from the Greek for seed. Thus ‘plants yielding seed’ may include plants reproducing via spores. Seed-bearing plants, in turn, include both gymnosperms (predominantly conifers), where the seed is exposed, and angiosperms (flowering plants), where the seed is enclosed within a fruit. But only angiosperms can be described as fruit trees. In the fossil record, gymnosperms appear after algae and mosses, angiosperms later still. Familiar fruit trees such as pomes, almonds, peaches and the like all have an evolutionary history within the angiosperms. Whether or not they were the same as these, fruit trees were also created. ‘Out of the ground Yahweh God made to spring up every tree that was pleasant to the sight and good for food.’ Recognition of the one fact does not require denial of the other. Creation and evolution here both apply. God has the power to call things into existence both ex nihilo and as the culmination of an evolutionary process – even the same things. Who knows whether there were not almonds, grapes and apples in the garden of Eden? The antediluvian world preceded the earliest fossils. In contrast to present-day vines, the grapes cultivated by Noah must have derived from vines created as vines. Likewise with the flocks of caprines (Gen 4:2), the cattle (4:20), the raven and doves (8:7f) and the olive (8:11). Modern caprines descend from a group that include sheep, deer, cattle and the giraffe, none of which were originally domestic animals. Ravens are passerines (songbirds) and as such related to sparrows and birds-of-paradise. Some birds (e.g. ostriches) evolved from dinosaurs, just as some mammals may have evolved from ‘reptiles’, though it does not follow that all birds descend from dinosaurs or all mammals from reptiles. Olives are a product of the diversification of angiosperms. The arrival at the same destination by genealogically different routes – known as ‘convergence’ or ‘parallel evolution’ – is a well documented phenomenon in biology, and demonstrates that evolution is not a godless, random, uncontrolled process. The suggestion that evolution over time converged on forms existing in the created world is a similar concept. But this is to leap ahead. At this point in the narrative the universe is illuminated, but empty. The earth has been divided into sea and land, but it has no life. Days 4–6 of the creation week parallel Days 1–3 by describing how the new environments are now filled, whether with celestial bodies, as in the case of the illuminated space created on Day 1, or living souls, as in the case of the seas, firmament and land created on Days 2 and 3. God commands that two luminaries be placed within the firmament. Within a few months the luminous matter of the starless proto-galaxy – that remaining at the centre after jets of plasma have shot out – will collapse into a black hole, and another light-giver will be needed to differentiate between day and night. It is created now. It will also be needed to determine the days and years by which time is measured, and to provide regular warmth. (The latter function is not mentioned, because at the beginning of its history the sun was cooler and the atmosphere’s capacity to retain heat greater.) Like the unnamed luminary on Day 1, the unnamed sun now separates light from darkness. God names the day, the night and the heavens but not the sun or the moon, as if to emphasise that these are just objects, not deities, despite the word ‘rule’. The greater luminary rules or controls the day, the lesser luminary the night. The ‘stars’ are also formed. In ancient Hebrew, as in any language before the age of modern astronomy, the word simply means a light-giving celestial body, be it a fixed star, a wandering star (i.e. planet) or a shooting star (meteor). Here the context shows that planets are signified. Stars in the modern sense can and do form naturally by condensing out of the debris of exploded, massive, earlier stars and, more voluminously, from the streams of matter issuing from galactic nuclei. They exist only as components of galaxies. There are no isolated stars in the space between the Milky Way and nearby galaxies to support the idea that they could have been created independently. Most formed very early in the universe’s history. Planets also form naturally, though nothing remotely like our own solar system is known. In particular, the rocky, watery Earth appears to be unique. The sun, the moon and the planets are set in ‘the firmament of heaven’ that God formed on the second day – in the expanse that is interplanetary space, not the sky (or ‘vault’). One of their functions is to act as signs. The magi interpreted certain planetary associations to indicate that a royal child would be born in Judah. At the end of the age when the Lord punishes the world for its evil, the sun and moon will become dark (Isa 13:11), much as the sun was darkened when his wrath was expiated on the cross, but on a larger scale. Another function is to determine appointed times (‘seasons’ is not the right translation) when certain festivals were to be celebrated, on particular days in a particular month. Genesis does not say how many planets there were originally. Joseph’s dream of the sun, the moon and eleven stars bowing down to him (37:9) seems to reflect a tradition that there were originally twelve. Similarly, in Revelation 12 there is a vision of the sun, moon and twelve stars. A third of the ‘stars of heaven’ are swept down and crash on the Earth: evidently not other suns in the galaxy but asteroids and meteoroids, fragments of exploded planets. That would leave eight, if we include the Earth among the twelve. That the solar system might have witnessed the destruction of one or more planets early on in its history and that the Earth has repeatedly been struck by asteroids – most catastrophically at the end of the Hadean period – were ideas beyond our comprehension until the 1970s. Now we can perceive what the Bible means when it speaks of stars falling like figs blown by a strong wind from a fig-tree (Rev 6:13, alluding to Isa 34:4). The stars are asteroids, and the wind the solar wind, intensified by a catastrophic coronal mass ejection. God commands the seas to abound with teeming life: with the tannim and everything that moves in the waters: sharks, fish, cephalopods and every other kind of sea creature down to microscopic protozoa. The exact meaning of the word tannim is difficult to determine; ‘monsters’ is inaccurate because there is no implication of great size, and ‘whales’ has the additional fault that these – like ichthyosaurs and other marine reptiles and mammals – are known to have evolved from land animals. In other contexts a tannin (singular) can be a serpent (Ex 7:9). Like the English word, it is not the normal term for snake (which is nachash), though an actual snake-like animal does seem intended (cf. Deut 32:33). In Ezekiel (29:3, 32:2) it appears to denote a crocodile. The text sets no bounds on how far what was originally created could have evolved over time. The essential meaning is that long ago God created animals that move and swarm in the seas, either the same as those now or ancestors with different forms. There may be an element of prolepsis in the descriptions. One might suppose that ‘waters’ means ‘oceans’, but again the text is less specific. Waters include lakes and rivers, with ‘seas’ being simply large bodies of water, including lakes, so tannim may not have been marine creatures. The term is a collective noun, like the other designations of animals. Almost certainly the creatures became extinct during the Deluge, so they were never fossilised, and the difficulty of identifying which animal is meant in other biblical texts reflects the fact that they existed later only as an idea. According to some, the tannin was the ‘dragon’ Rahab/Tiamat and as such a kind of deity. Originally, the animals were created beings. They all have the same breath. All go to one place; all are from the dust, and all turn to dust again. Who knows whether the spirit of man goes upward and the spirit of the beast goes down to the earth. Similarly in gestation: we do not know how the spirit comes to the bones in the womb of a woman with child (Eccl 11:5). All we know is that it does. The spirit is not a mere ‘epiphenomenon’ of matter. The coming into being of every child – indeed every animal – requires the direct input of God (cf. Ps 139). The experience of every person that he is a conscious, living being, the instinctive knowledge that the gratuitous taking of life is wrong and not to be justified by ‘survival of the fittest’, the truth that one relates best to fellow human beings on the basis that they too are living souls, all accord with this perception. They contradict the dogma that makes no distinction between life and non-life. When biologists speculate that all organisms are ancestrally connected to a single ‘tree of life’, they include non-living organisms as well as living: microbes, fungi, plants and protists as well as animals. How the spirit of a fish, say, evolved into the spirit of a human being is seen as a non-question. Like bacteria on the one hand and human beings on the other, fishes are seen through the lens of ‘science’ as biological automatons; consciousness is an illusion. But the Bible concurs with experience in maintaining that all animals have an inner life and this immaterial ‘breath’ is something real. It is dogmatic science that is out of line. Another mistranslated word is owph (v. 20 etc). It designates any animal with wings, not necessarily just a bird (for which Hebrew has a separate word). Winged creatures include various kinds of insect. They are each made ‘according to their kinds’, and their assigned environment is ‘above the earth, across the face of the firmament’. The face of the firmament, as one looks up, is the lower part of the sky. Genesis says nothing about ‘fixity of species’ – the idea that everything in the world is as it was when it was created. Plants and animals change over time (as presaged by the curse on the snake, condemned to lose its legs), and can give rise to new species. ‘Kind’ in the text is a more general word. ‘Species’, the lowest unit in biological classification, implies the contemporaneous existence of genealogically related species, but in the beginning, with the first generation, there can be no such implication. The text tells us only that within each category of plant and animal there were numerous kinds, and the kinds were distinctive. On all this life God commands a blessing, and says: “Be fruitful and multiply and fill the waters in the seas, and let the flying animals multiply on the earth.” He could have created a world that was fully populated from the beginning and had no ability to reproduce. But he did not. He engineers animals so that they can procreate: they have within them their own seeds of life, like the seeds produced by plants, which also reproduce sexually. He endows them with the ability to multiply and colonise new territory, implicitly with the ability to ‘evolve’, to diversify as they multiply and to adapt to diverse ecological niches as they spread abroad. Nonetheless, it is God who gives life to their embryos, for ‘life’ is distinct from what is in the first cell. In that respect every new creature requires his involvement. Every naturally born animal is a fresh creation. The created world is autonomous, but not independent of its Creator. “If he were to take back his spirit and gather his breath to himself, all flesh would perish together, and man would return to the dust” (Job 34:14f). The earth brings forth animals: beasts (behemah, not ‘cattle’, which are first mentioned in 4:20), creatures that now creep (lizards, millipedes and the like) and animals of the earth (worms and other burrowers) – again, each according to its kind. As before, the distinctions are those of environment: the beasts move clear of the ground, the creeping animals creep along the ground, and the animals of the earth live under the ground. There is no distinction between wild and domestic animals, or between mammals and reptiles. Finally, on the same day, God makes man, another terrestrial animal – one male and one female. They are the climax of his work. He makes man ‘in our image, after our likeness’, male and female together reflecting his nature. As the plural now unexpectedly reveals, God has been speaking to someone when issuing his commands. It is easily overlooked that a command implies someone to whom a command is given. One of the attributes of God is that he speaks, before creating a human being who can speak, and he creates by speaking. It is only with the incarnation and revelation of Jesus Christ that we learn that he, the first Son, was the one who performed the commands. He was with God in the beginning (John 1:2). All things were made through him, and nothing made without him. In him all things were created, both in heaven and on earth, things visible and invisible… all things were created through him and for him. He is before all, and in him all things hold together. And he is the head of the body, the church; being the beginning, the firstborn from the dead, that in everything he might be pre-eminent. For in him all the fullness of God was pleased to dwell, and through him to reconcile to himself all things, whether on earth or in heaven, making peace by the blood of the cross. It was the Son obeying the Father who executed the commands, being by nature also God (‘And God said… And God made’). It is not that man thought of God in his own image. Rather, in his body man reflects the form which God himself takes when he appears in bodily form (so Gen 3:8, 18:1f, Ezek 1:26). He is to have a god-like spirit and a god-like function, exercising dominion. He is to rule, not as one man over other men, but collectively over the earth and everything that lives on the earth – a function enlarged upon in the next chapter where subduing the earth involves tilling the ground and ruling over every beast and flying animal involves giving them names. He can understand speech. On the man and the woman God commands a special blessing of fruitfulness, and explains what they may eat: “See, I have given you every seed-bearing plant that is on the face of the earth and every tree with seed in its fruit. And to every animal of the earth and every winged creature of the air and everything that creeps on the earth – whatever is a living soul – I have given every green plant for food.” There is no death in the original food chain. The animals are designed to eat only plants, which are non-living: God makes certain plants specifically for food, and they will provide nourishment enough. And God looks over everything that he has made, and sees that it is very good. The sixth day passes. And on the seventh day God rests, blesses it, and makes it holy, for the heavens and the earth are now finished, the world is founded (Heb 4:3). It was a pattern which he required all who worshipped him to follow, not for his sake but for their own: ‘For in six days Yahweh made heaven and earth, the sea, and all that is in them, and rested on the seventh day’ (Ex 20:9). The commemoration of God’s work of creation in the beginning ‘is a sign forever between me and the people of Israel’ (Ex 31:17). If this had been the end of the story, we could now plumb the lowest strata of the earth, investigate the moon, consider the origin of plants and animals and assess the veracity of the tradition according to whether they all look as if they had been supernaturally created. But it was not the end. As we read on, we find that man – initially innocent and unknowing – chose a path on the eighth day contrary to the will of his Creator. He listened to the tempting thought that, if he acquired the knowledge of good and evil, he would be like God. So he tasted evil, and consequently he did acquire knowledge. It was a corrupting knowledge. He found sin now couching at his door, desiring to be his master, and, if he was to be like God, he had to overcome it. In practice he became its slave. Adam’s first son became a murderer of his second, further down the line a polygamous Lamech boasted that he had killed a man, and eventually the wickedness of Adam’s descendants was so great that God could abide it no longer. He was sorry that he had made man. It grieved him. The creation of man had been the climax of his work, and in a sense everything had been made for his sake. Now through man everything was corrupted. So God said to the one man who was blameless in his generation, “I have determined to make an end of all flesh; for the earth is filled with violence through them; I will destroy them with the earth. I will bring a cataclysm of waters to destroy all flesh in which is the breath of life from under heaven. But I will establish my covenant with you.” And that is what happened. The cataclysm razed even the highest mountains. It blotted out every creature that moved on the earth. It was little less than an undoing of the whole creation. The earth returned to a state of formlessness, overwhelmed by water. The subterranean deep burst through the springs that had once drawn from it, much of the envelope of water around the solar system was dispersed, some of it collapsing back onto the earth, and the atmosphere was torn by the fragments of a planet between Mars and Jupiter. As has become apparent from exploring other parts of the solar system, the cataclysm was the selfsame event that caused the moon to be bombarded. Melted by thermonuclear fusion and stupendous rates of radioactivity (consequences of the higher speed of light), the Moon had already been smothered in lava kilometres thick. So had Mars, Venus and Mercury. In one way or another, every body in the solar system had been transformed. The original face of the creation ceased to be visible. What we see now has a history, and that history leads back to a moment of destruction, not creation. In a sense, that is the world’s ambiguity: the creation is hidden, just as its Creator is hidden. We see him only if the heart desires to see him, ‘for now we see in a mirror dimly’ and understand only in part. It is by faith that we understand that the world was fashioned by the word of God, from things invisible. The Creator has so ordered the world that we have to look beyond what can be seen, for only thus can we know him. It is the same with the fossil record: we can trace the lineages of organisms, if at all, only so far back. Some kinds had forms that changed little from how they look now; a few underwent radical transformation. While by no stretch of the imagination can they all represent a single tree of life, nor can we trace their lineages back to the creation, or even close to it. An entire world was expunged. A much eroded and much deformed stack of geological strata exists only because after that cataclysm the world had to start afresh, this time by natural means. The Earth had to regenerate itself, and re-creation was a process that was to take tens of thousands of years, not six days.